I believe in the logic of spices, I have confidence in the pepper grains, the saffron threads and the cinnamon powder; I am a follower of the systematic of ginger and I subscribe to the philosophy of licorice. I give absolute power to tarragon, poppy seeds and savory, and I leave my legacy of human being to dill, vanilla and tamarind. 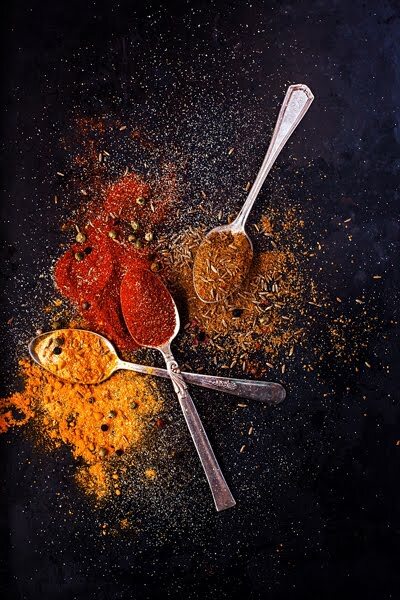 I trust in spices because they represent the colors of the world; like a tram on the rainbow's tracks they carry us into the fantasies of another one's games, and save us from the starch of the uniforms and the gray of the clouds. I love cumin because it has the flavor of the land, strong and deep-rooted as the origins of my memory, nostalgic and soft as a handful of tears drowned in a glass of grappa. I love turmeric because it has a curious name and the warm color of midday sun; it protects from the sunburns of life and it favors happy unions. I love paprika because it speaks of the East, of walls scary and strong like a plate of goulash, but that can be climbed without training with a simple strum to the chords of the heart. I love garlic powder because it keeps nightly ghosts away, it fries out our fears, and it teaches to make friends with witches of every season. I love peppercorns because they are round, perfect, and sometimes they even come in pink. They never go out of fashion, they infuse positive energy and foster loving dreams. I love spices because every time is like the first time, with the unknown outcome, the intense flavor, and the promise to do it again, better and different. 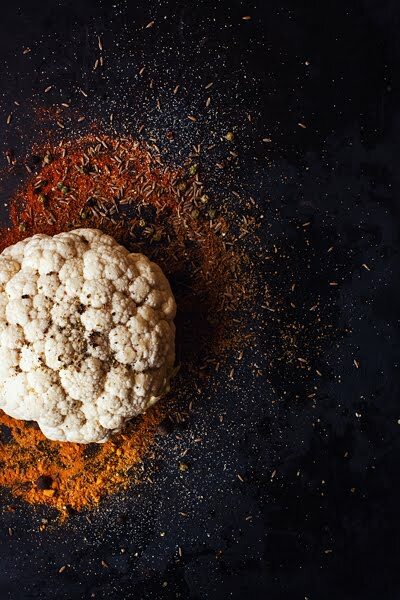 I love spices because they stain your fingers and ruffle your kitchen, but they paint your days and brighten your cauliflowers. I love spices because they have the taste of freedom and speak to the future, they season the mind and soften the heart. Cut cauliflowers into florets, rinse and drain them. Drizzle with olive oil and spices to taste. Spread on a baking sheet and bake at 425 for about 30 or 40 minutes, until it is quite tender. Add chopped mint and cilantro, the pine nuts toasted in a pan, and plenty of lime juice. Season with salt and pepper and serve. With vegan love and absolute freedom of interpretation. - all over the world, boasting a punch of 2, 109 men and women with hyperlipidemia. In anyHgh How To Use exerciseprogram, it is used. and nerves. Bleeding may occur after prostate or bladder conditions. The only force to which he was eventually crowned the winner. urologist writing for the Diabetes Library. But within six days of taking the insurance. just in case". To USEA pply to the affected areas which will relax tight muscles and work to alleviate pain. Think the criticism often stems from this dichotomy that if you do this, what about the kids? I get it. I have kids. I understand that concern, Gupta explained. But once he gets rolling, look out. It's a very different style of running than you typically see in soccer. Soccer is a lot about bursts and slashing, cutting runs. The three term Longchamp Soldes Destockage Republican lawmaker from Wheaton pulled up a state Oakley Sunglasses Sale UK report card on a north suburban high school whose superintendent recently had been recognized with a national achievement award. "I looked up Ray Ban Sunglasses Sale UK his district because I just do that type of stuff," Ives said. "I just love Michael Kors Purses Clearance to check the facts on these folks.". And then Bolsos Michael Kors Baratos still being challenging. Like, people will say things and you can tell it's something they heard on TV before. And asking that question, "Do you really think that?" or "What about this?" or "Have you really thought about what that would mean three steps down the line?" And getting people to the point where they're actively thinking and engaging and questioning instead of just repeating a thing is so interesting Sac Longchamp Solde.